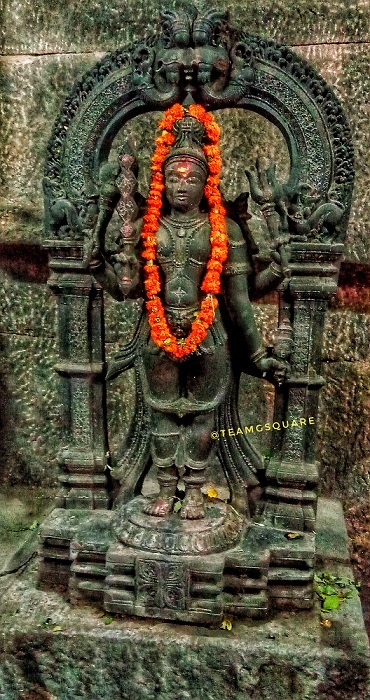 "Samharamurtis" are one among the five classes of representation of Lord Shiva’s various aspects, the others being the Anugraha-murtis (or boon-conferring aspects), the Nritta-murtis (or dancing aspects), the Dakshina-murtis (or the yogic, musical and philosophic aspects), and other minor aspects. Samharamurtis portray the destructive or terrific aspects of Lord Shiva. Each form or image of Lord Shiva under this aspect is indicative of the destruction of a particular maleficent and troublesome being. The various forms comprised in Samharamurtis are Kamantakamurti, Gajasuramsamharamurti, Kalarimurti, Tripurantakamurti, Sarabhesamurti, Brahmasiraschchhedakamurti, Veerabhadramurti, Jalandharavadhamurti, Mallarishivamurti, Andhakasuravadhamurti, Aghoramurti, and Mahakala. The ‘Kamantakamurti’ illustrates Lord Shiva burning down and destroying Kama/Manmatha, the god of love by opening his third eye and emitting flames of fire which reduced Kama to ashes. Lord Shiva is portrayed in yogasana, with three eyes and four-arms. Kama lies standing before him accompanied by Devbhaga while his consort Rati stands nearby along with Vasantha. Kamantaka’s mudras are pataka and suchi; his emblems are a drum and trident. 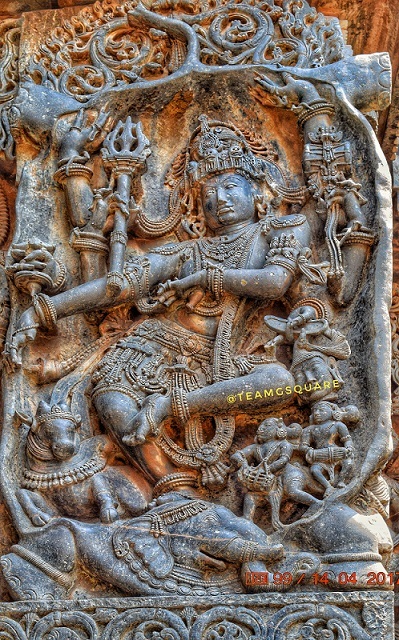 The ‘Gajasurasamharamurti’ depicts the destruction of the elephant demon Gajasura by Lord Shiva, who is depicted in a terrific form dancing vigorously on the elephant’s head with the animal’s hide arranged behind him like a prabhamandala (aureole). The right leg of Lord Shiva is planted firmly on the elephant's head while the left is bent and lifted up towards the knee of the other leg. He may hold a tusk, club, dhatura flowers, alms-bowl, bell, drum, sword, skull-topped staff, antelope, snake and spear. The ‘Kalarimurti’ depicts the legend of Lord Shiva punishing the god of death, Kala/Yama for attempting to kill Markandeya who was a great devotee of Lord Shiva. 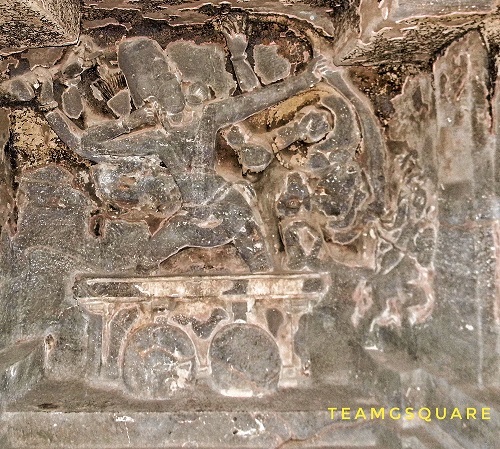 Lord Shiva is seen as four armed, issuing from the linga in front of which is the boy Markandeya kneeling with his arms folded on his bent knees. 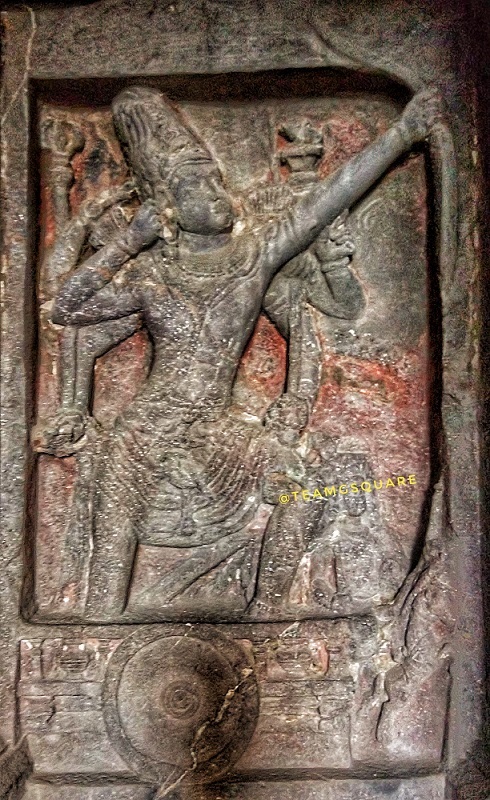 One of the right and left hands of Lord Shiva grasp a stout handled sharp trident aimed at Yama’s abdomen. The other right hand rests on the hip (katyalambita hasta) and the left hand is held in vismaya pose. The right leg of Shiva is buried up to the knee in the linga and the left leg is represented as kicking Kala. Kalari’s emblems are a skull-cap, sword, shield, antelope, axe, snake, noose, trident and vajra. 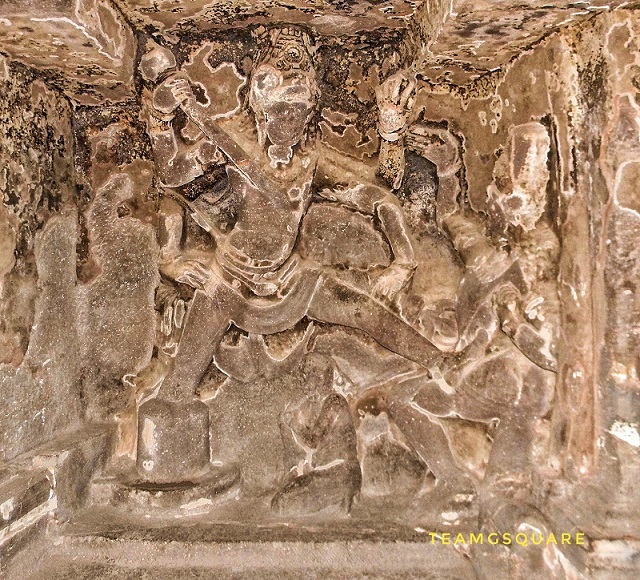 The ‘Tripurantakamurti’ depicts Lord Shiva destroying the three asuras (demons) Vidyunmlali, Tarakaksha and Kamalaksha (sons of demon Tarakasura) who dwelt in three forts constructed of metals and caused great damage to the suras and the rishis (sages). Lord Shiva stands in a chariot with his left leg kept forward and the right one behind; the body of Shiva is turned away form the objects aimed at, but his face and arms are turned in the direction of the three castles which he is about to destroy. He seems to have had ten arms; those that still remain unbroken are seen carrying the sword, shield, arrow string in the bow-string and a bent bow. Lord Brahma is driving the chariot which is yoked to two horses. 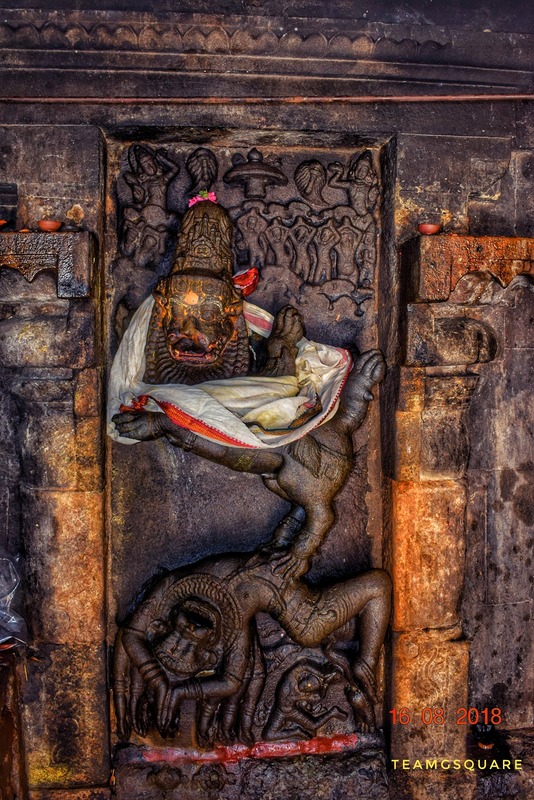 The ‘Sarabhesamurti’ depicts the slaying of Lord Narasimha by Lord Shiva in a fierce form, part man, beast and bird, when Lord Vishnu refuses to abate his terrific attitude after killing the demon Hiranyaksha (an ardent devotee of Lord Shiva) which was causing damage to the inhabitants of the world. Sarabha is described as having eight lion-like legs with sharp claws, a long tail and two wings of resplendent beauty; the body above the loins should be that of a human being but having the face of a lion which should be wearing a kirita-makuta upon its head. The ‘Brahmasiraschchhedakamurti’ depicts the form Lord Shiva assumes while cutting off the fifth head of Lord Brahma with his left thumb-nail. 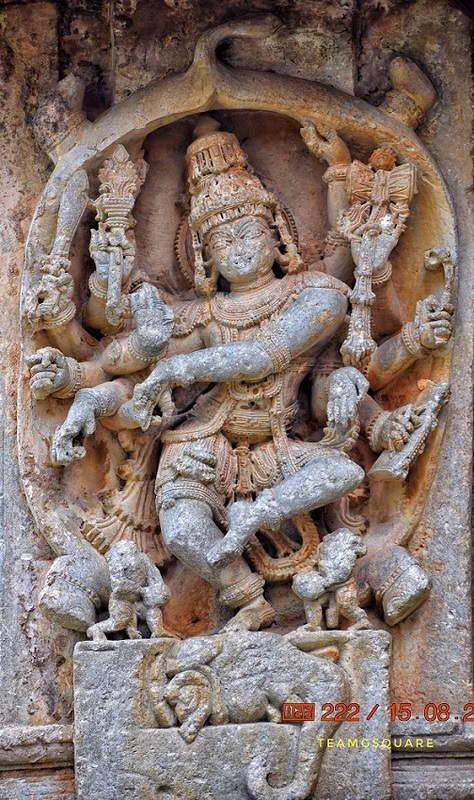 Shiva is portrayed as three-eyed and four-armed with a jatamakuta on the head, and wearing a makarakundala in the left ear and patrakundala in the right. 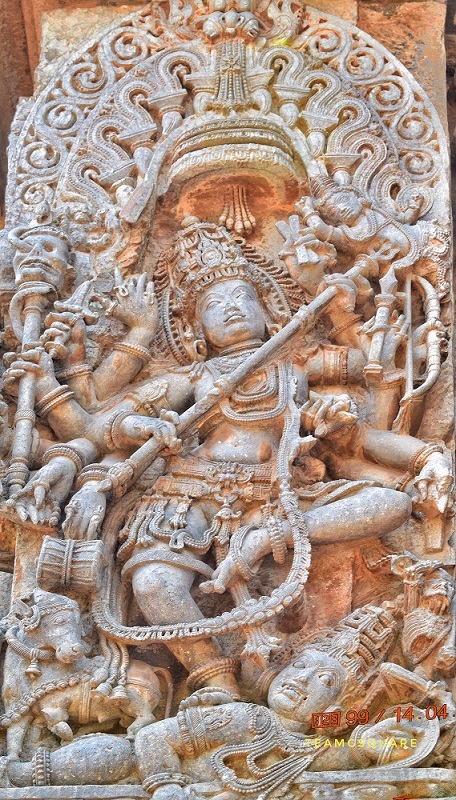 In his left hand are the shula (trident) and Brahma’s skull and the right hand are a vajra (thunderbolt) and parasu (axe). The ‘Veerabhadramurti’ depicts the form Lord Shiva assumed at the time of the destruction of the yagna (or sacrifice) of Daksha. 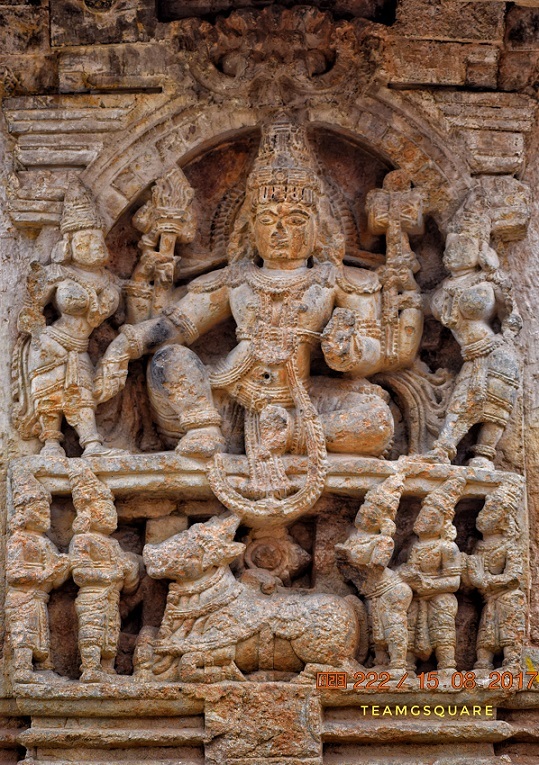 Lord Veerabhadra is depicted as three-eyed, four-armed, and with tusks protruding from his mouth. He wears sandals and a jatamakuta, and is decked with garlands of skulls, bells, scorpions and other ornaments, a yagnopavita (scared thread) of snake, and adorned with beautiful anklets. 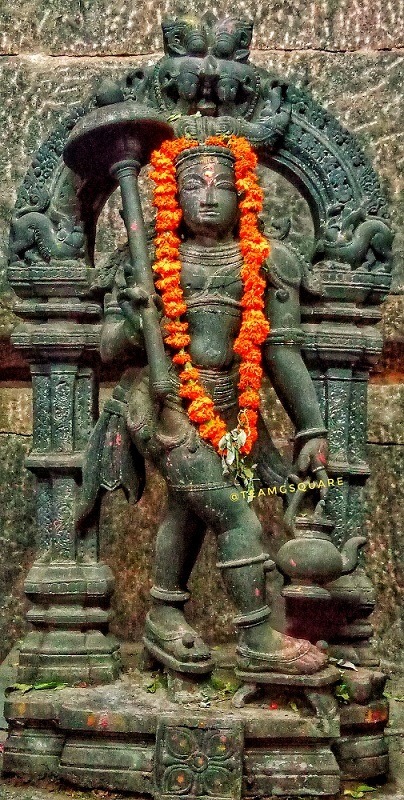 He is seen carrying a khadga (sword), khetaka (shield), dhanush (bow) and bana (arrow). In the below photograph is seen an unusual and rare depiction of Lord Veerabhadra having 5 faces and 12 arms, with Daksha Mahaprabhu standing besides him. The ‘Jalandharavadhamurti’ illustrates the destruction of the demon Jalandhara by Lord Shiva. Lord Shiva is depicted as three-eyed and two-armed; holding an umbrella in his right hand and a kamandalu or a water-vessel in his left. He is adorned with kundalas (earrings) in the ears, haaras (necklaces) on the neck, anklets on his legs, with his feet resting on a pair of sandals. The posture of Lord Shiva is indicative of his desire to move quickly. The ‘Andhakasuravadhamurti’ depicts the destruction of the demon Andhakasura by Lord Shiva. He carries a trishula (trident) at the end of which is pinned the body of Andhakasura and from it blood drops down into a cup held by the goddess Yogeshwari (Kali). 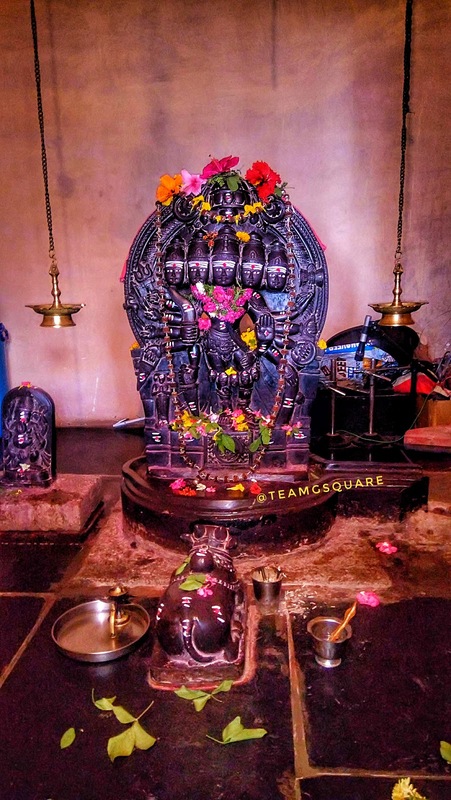 In the below picture, he is seen with 14 arms with Lord Nandi on his right. He may hold a drum, rosary, chisel, trident, spear, staff with a pierced head, bow, arrow, noose, and a thunderbolt. Very informative....good post.- Rajesh Naik.